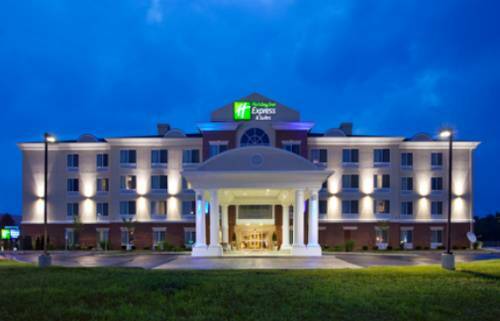 Enjoy our Franklin Hotel's Top-Notch Amenities Welcome to the beautiful Holiday Inn Express hotel in Franklin, Ohio. With a convenient location off I-75, just 16 miles from Dayton, we are the ideal choice for both business and leisure travelers staying in Franklin. Our hotel's location provides easy access to many popular attractions. We are not far from shopping at the Dayton Mall, family fun at Kings Island and The Beach Waterpark or outdoor adventures at Caesar's Creek State Park. With just a few minutes of driving, you can also catch a show at La Comedia Dinner Theatre and explore the murals in downtown Franklin. Lodging here is convenient for business travelers, as well. We are located near several area corporations, including Dayton Daily News, Lexis-Nexis, Faurecia, Pioneer Automotive, Braden Sutphin Ink and AK Steel. Our hotel is also just 13 miles from the University of Dayton and just 14 miles from the Dayton Convention Center. It's easy to host the perfect meeting in Franklin, with our hotel's two meeting rooms. We offer more than 1,200 square feet of meeting space, 24-hour business center and free high-speed Internet access. While staying here, you can enjoy other great amenities like our complimentary, hot breakfast buffet, a 24-hour fitness center and a heated, indoor pool. Whatever your reason for traveling to Franklin, lodging at our hotel lets you have a carefree and enjoyable trip. Private 180 sq ft Board Room with fixed set Board Room table, Pull down A/V screen, natural lighting provided by (1) outside window. Temperature controlled within room with personal thermostat control. Speakerphone for conference calls. www.golfheatherwoode.com Heatherwoode features a beautiful 18-hole championship layout nestled in the small, close community of Springboro, Ohio. Playing to 6,730 yards, the course is a challenging, yet enjoyable playing experience for all.